/ What is Sugar Free? I wanted to do a quick nutrition post for you, mainly because I have been carefully looking at my diet recently and the whole issue of sugar is a big thing in the news at the moment. The problem I have with the definition of sugar free is that it is used to mean different things all over the place and actually working out what to eat is a real problem. Davina McCall – 5 Weeks to Sugar Free – In this cookbook Davina McCall tells you how to go sugar free and in this case Davina is talking about “a diet free of refined sugar – things like processed foods and white flours, rice and bread.” Read the full article here. Sarah Wilson – I Quit Sugar – This book takes you through an 8 week program to quite sugar and in this case Sarah is talking about quitting Fructose, this is found in regular white sugar and most fruits however you can still eat honey and glucose. Read more about Sarah here. Dr Mark Hyman – 10 Day Detox Diet – This regime will ask you to give up all fructose, glucose, honey and even sugar alcohols like xylitol and stevia. You will also have to cut out all grains and beans. The only “sugar” you will get is from berries or other vegetables like carrots. Read more here. These 3 options are just 3 ways to approach the “Sugar Free” problem and this is before you even start considering the glycemic index and load of the food you are eating. A great resource for this is Dr Patrick Halford. So with this in mind I have put together some guidelines that I would consider will put you on the right track, I will not call them sugar-free because in all reality that is actually an impossibility. 1. Avoid ALL Refined Sugars – So I am with Davina on this one, all refined sugars should be avoided, they have no nutritional value at all and will just damage your body. 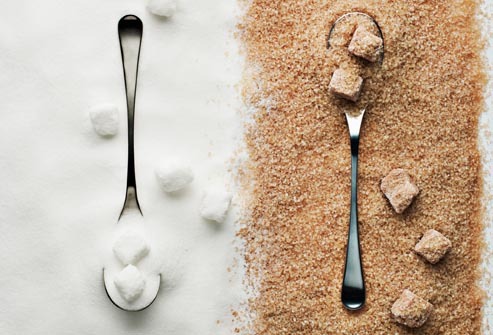 So what is a refined sugar? Well if any of your food has the following in the ingredients sucrose, glucose, fructose, maltose dextrose, lactose, high fructose corn syrup, molasses, honey, evaporated cane juice, fruit juice concentrates, cane crystals and corn sweetener the you have refined sugars and they should be avoided. 2. Eat Starchy foods Rarely and avoid Processed as much as possible – I keep this rule very light because I think if you start thinking you are never going to eat white bread, pasta or rice or even potatoes ever again it can be a bit daunting. Also sometimes you will slip, I do. There are times when that baguette is just too tempting, don’t beat yourself up about it, a small amount of white flour occasionally will not do you any harm. In terms of the effect on your blood sugar brown bread and rice is almost as bad, not quite but almost so keep these limited too. Eat small portions and try substituting with oats, quinoa or wild rice is a great option. 3. Eat Fruit With Care & No Fruit Juice – Basically a fruit juice is just sugar with no fibre so it is like drinking pure fructose, not a good idea and to be avoided. When you eat fruit you have the fibre as well, this goes for smoothies too. Just be aware that some fruit is high in sugar, and so should be eaten sparingly, plus dry fruit is to be avoided even it is lovely. Fruits that are very low in sugar include all berries, plums and kiwis. Other good ones are apples and pears. If you want to eat things like bananas and mangos and other high sugar fruits do it in moderation and have smaller portions. 4. Adapt to Your Activity Levels – This can be a bit harder to judge because it is perception but I go for a run most mornings, sometimes it is just a recovery run and I do not use much energy but if I go for a high energy run then I burn through a lot of calories. You need to fill yourself up and this should include a big portion of fat but I also think I need more simple carbs that act quickly, so adding a banana to my breakfast usually does the trick. Get to know your body and what it needs most to recover. 5. Eat More Fat – Many people are scared of of fat because of so many myths that have been put out about eating it makes you fat, it does not, that is official now. Some great sources of fat include raw nuts and seeds, coconut oil and avocado. I always try and have a good portion of food with every meal because this will help burn fat and it also fills you up quicker. Again be careful here, only cook with olive oil, coconut oil and butter and use your other oils for salads and drizzling. If you want to use margarine get a non-hydrogenated one, this is really important otherwise you are opening yourself up to a world of pain. 6. Find a Natural Sugar Replacement – Stay away from all artificial sugar substitutes these are even worse that sugar. If you want to keep the sweet taste then try a sugar alcohol like Xylitol or Stevia. These are both a lot sweeter than sugar and so you need to use less but they are much better for you. You can also try things like Maca Powder or Lucuma which are both naturally sweet and are super foods too! Recently there has been a lot of talk about Yukon Syrup and this could be a good alternative too. 7. Be Realistic – I know that a lot of what goes out in the media is scare tactics and if you believed it you would think that a small amount of sugar and you are doomed. We live in the real world and we will all eat some sugar in one form or another. Just do your best to make it the form that is best for you but if you have that chocolate bar occasionally, well it really is not the end of the world. Just bring some balance into your life, everything in moderation which I know a lot of nutritionists hate because it makes their special diets useless but the reality is there is no substitute for a balanced diet that includes some stuff that is bad for you as well. I can see you reading that and questioning me but lets be honest we are all emotional about some things and eating the odd naughty thing that makes you feel good is fine. Sometimes you just cannot beat my mum’s homemade chips and the fact I only eat then now and then makes them all the better. Enjoy life, stay balanced and don’t worry. I know I said I was going to make these simple rules and they might seem a bit more detailed then they needed to be but I wanted to get it covered. You can see that really there is not that much to it and that in reality there is no such thing as sugar free and neither should there be. I would love to know what you think about this issue and what your view of sugar free is.